Charles Brogdon recently sent NewscastStudio some photos of the miniature models he builds from Legos and other materials. 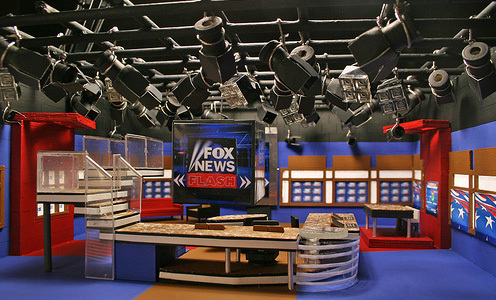 While most of the miniatures he’s built are of television shows such as “Friends,” he has built two TV news sets — Fox News Channel and BBC. In addition to Legos, Brogdon uses plastic, aluminum, basswood strips, photographs, poster board and paint to build his models, which can take anywhere from four days to several weeks to build. “For example if a set has a staircase or lots of curves to it, that slows me down because of the difficulty in building it,” he says. He started building the models in 1988 after taking a studio tour in Hollywood. The models are surprisingly detailed, right down to the floating “cube” found on the Fox News Studio 8H. “I pick which sets to build depending on whether or not I think the set will translate well in a diorama form. Some shows that I built I like, some I don’t know much about,” said Brogdon. Click here to see photos of the BBC model and click here to see Fox News images. Brogdon has also self-published two books featuring his models, which can be purchased on Blurb.